Buying wood glue isn’t easy. When you walk into a store or browse online, there are a lot of choices. Prices vary massively, and each glue seems to have a different set of features to offer. So, how do you make that choice? For a start, you need something you can trust. 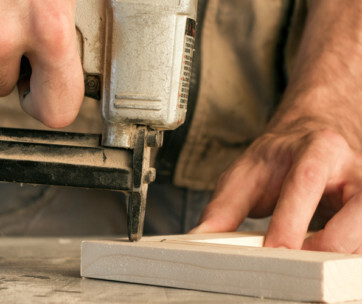 Whether you’re a professional carpenter or just fixing a piece of furniture, you can’t risk the glue breaking. Then, you need to think about what the glue is going to have to withstand. Is it going to be outside and have to withstand the wind, rain, heat, and cold? Or is it going to have to withstand a lot of weight? We’ve done the research to make sure you find the best wood glue for your project. In this list, you’ll find the five best wood glues on the market and a breakdown of their features and benefits. You’ll also find a detailed buying guide and FAQ section that will tell you how to get the most out of your wood glue and make sure it lasts for years to come. We’ve chosen Elmer’s E7330 as our best choice product this week. If you’re looking for a glue for creating furniture or any other carpentry projects, this is the product for you. It’s well respected amongst hobbyists and carpenters as one of the most powerful and versatile wood glues on the market. There’re a few reasons why it is so well thought after. First, it will bond almost anything to almost anything else. It’s not just for use on wood. In fact, it can be used on stone, metal, ceramic, foam, glass, and much more. That means you don’t have to have lots of separate bottles of glue taking up room in your shed. Secondly, it’s waterproof and resists heat, mold, and mildew. This is super important in carpentry because the wood that you are gluing together is likely going to be exposed to lots of different environments. So, it might seem like it has held together well, but you need that joint to be solid for years to come. That’s why, when you are creating pieces of outdoor furniture, you should choose a product like this one to ensure that the joints will hold. It also doesn’t give off any harmful fumes. This used to be a problem with adhesives, but now products like this are non-toxic and completely safe to use. It’s also really easy to clean up, all you need is warm water and a cloth. You should leave the wood clamped together for around 30 minutes, but the entire bonding process will take around 24 hours, so you shouldn’t put any stress on the joint until that amount of time has passed. It comes in a 1-gallon bottle. 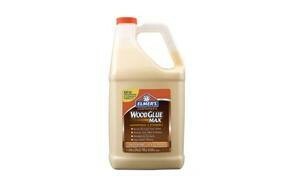 As Elmer says on their packaging, this glue actually bonds stronger than the wood itself. That makes it the best glue for wood to wood on the market. They also make it with real wood fibers, which means that, when you stain the wood, you can barely tell the difference between the wood and the glue. This is rare in the world of clear wood glues, which makes this product perfect for high-end carpentry. Elmer has been making adhesives for over 65 years. They invented ‘school glue’. Amazingly, they used to package their glue in a clear, glass bottle with a lollipop stick attached by a rubber band. This was to make it easy for people to apply the glue. For more great tool options, check out our guide to the best tape measures. Second in our list had to be “America’s best-selling glue”. Gorilla Glue has only been around for a decade or so, but it has quickly become one of the biggest glue brands out there. There’re two reasons for this – the amazing adverts (if you haven’t seen them, get to YouTube) and the fact that the glue is as strong as the adverts say. Gorilla Glue was initially being used in Indonesia on teak furniture. The founders of Gorilla Glue quickly realized that it was one of the most versatile and impressive adhesives they had ever seen, so they brought it back to America. Their wood glue is a water-based adhesive that is perfect for use on all hardwoods, softwoods, and natural wood composites. That means it can be used on pretty much any carpentry project. Like the Elmer glue, it only takes around 20 or 30 minutes to bond but takes a full 24 hours to fully cure. So, you can use whatever you’re gluing after 30 minutes, but we’d definitely recommend leaving it for the full 24 hours. If you want to get the most out of this glue, you should leave it clamped for longer than the 30 minutes. Scroll down to find advice on how to get the perfect bond with wood glue. The main reason we have put the gorilla glue at number two in our list is the water-proofing capabilities. On the face of it, it’s as strong a glue as Elmer’s waterproof wood glue, but it’s only water-resistant, not fully waterproof. If a glue is fully waterproof it will pass ANSI Type 1 waterproof tests, but the Gorilla Glue only passes ANSI Type 2 tests. 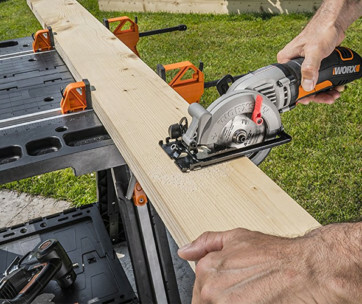 Having said that, it is still fine to have it in your tool bag on outdoor projects, but it won’t stand the test of time as well as Elmer’s product. Like the first glue, it dries in the natural color. It doesn’t have the real wood fibers, but it still blends really well with the natural wood look. 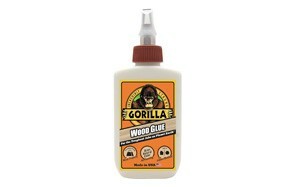 The Gorilla Wood Glue is undoubtedly one of the strongest wood glues on the market. It dries quickly and cleans up really easily. Plus, it comes in many different sizes, so you don’t have to fork out on a gallon at a time. If it has passed the ANSI Type 1 waterproof tests, it would probably be our best choice product. But, because of the excellent price, we’ve chosen it as our best value product instead. Titebond 3 Ultimate Wood Glue is another excellent product that’s pretty hard to distinguish in quality from the first two. If you type it into YouTube, you’ll find multiple woodworking pros singing its praises, saying it’s the best adhesive wood glue you can get your hands on. Titebond has been in the game for over 80 years, so it stands to reason that they know a thing or two about wood glue. In fact, Titebond 3 was one of the first wood glues to pass the ANSI Type 1 waterproof tests, possible making it the best wood glue for furniture outdoors. Like we have talked about already, a wood glue that passes the Type 2 water-resistant test can be used outdoors, but if you are working on something that is going to be damp all the time – like a plant pot or a water feature – it is definitely better to use a wood glue that is fully waterproof. There are three different types of Titebond glue (original, premium, and ultimate). This has come from years of innovation and product development. This product – the ultimate version – is better in every way than their previous glues and is a fantastic outdoor wood glue. It’s designed to have a strong initial tack, which means it sticks together quickly, but it also offers a longer timeframe to adjust the wood if you get it wrong. You can still adjust the wood for 8-10 minutes after application, giving you plenty of time to get it right. Another excellent feature of this glue is the fact that it is FDA approved for indirect food contact. That doesn’t mean you can eat it, but it does mean it’s suitable for use on items that might come into contact with food, like chopping boards. Plus, it’s non-toxic and solvent free, which makes it completely safe to use. The eagle-eyed readers amongst you will have noticed that this glue has a similar name to the last one. In fact, Franklin International 5005 Titebond II is the premium version of the last glue that we talked about in the last section. It’s slightly cheaper than the Titebond 3 Ultimate glue but is still an impressive wood glue. The reason it is cheaper is the fact that this is the water-resistant version. It doesn’t provide the same level of waterproofing but can still withstand moisture. So, it’s perfect for projects that are going to reside indoors or will only have limited exposure to the elements. We would definitely recommend saving your money if you don’t think you need the full waterproof version. Like the Titebond Type 3 glue, it is FDA approved for indirect food contact, so it could be perfect for making a chopping board or gluing together kitchen furniture. Plus, it can be easily cleaned up with water. This means that, if you apply too much glue to the joint, you can wipe it down quickly and easily without ruining the wood. It also looks fantastic when you sand it down, which makes it perfect for detailed carpentry projects. It doesn’t leave you as much time to adjust the wood as the Titebond Type 3, but you still have around 5 minutes. This is still one of the best wood glues around, and if you want to save a little bit of money, it is well worth buying instead of the more expensive version. Just keep in mind that it isn’t going to withstand the elements quite as well and therefore won’t last as long. Find more great products like this by checking out our guide to the best glue guns. Evo-Stik is well known for making serious adhesives. Their products are regularly used in the construction industry, so you know that they can make a pretty strong glue. 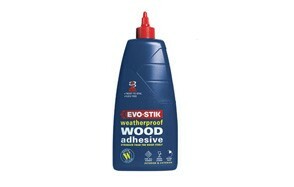 That’s why we’ve chosen the Evo-Stik Weatherproof Wood Adhesive as our premium product in this list. It costs a bit more than its competitors, but you get your money’s worth in strength. It’s an extra-strong adhesive that bonds considerably stronger than the wood itself. That means, if it ever snaps or breaks, it’s because the wood has failed, not the glue. This fast-drying wood glue actually sets in five to ten minutes. That means, if you are gluing in a rush or gluing many items together, this could be the product for you. To fully set it takes around 24 hours, in which times it dries completely clear. This gives you a quality finish that shouldn’t ruin the quality of the woodwork. Even if you are left with some excess glue on the wood, it’s very easy to sand down. Plus, you can paint over it or even stain it to match the wood color. It is sold as a weatherproof wood glue but makes no mention of the ANSI rating system. Without this information, it’s difficult to say exactly how well it will cope with exposure to the elements. However, they do say it is suitable for both interior and exterior projects, so it should be absolutely fine. If you are concerned about the weatherproofing capabilities, you should go with an ANSI Type 1 rated glue. This trade-rated glue is super-strong and reliable wood glue, so if you are looking for something that can really handle the weight, this is a perfect option for your project. 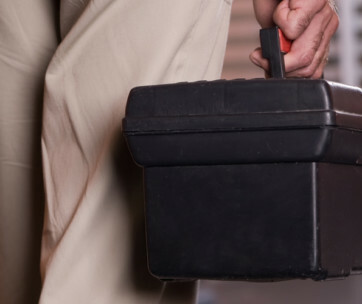 Don’t forget to check out our guide to the best torque wrenches for more great products like this. Wood glue is just one of those things that are really difficult to get off your skin. And it’s so easy to cover your hands in the stuff when you’re trying to glue stuff together. Fortunately, there are a couple of ways that will help get it off. Just using soap and water won’t work, you’ll just end up with hands that are red raw, and still covered in glue. There are different types of wood glue and they require different methods of cleaning. Polyurethane adhesive – If you’re using a polyurethane-based glue, you will need to get some lacquer thinner to try and prise the glue from your skin. It’s probably not going to remove all of the glue, but it should loosen some of it. When you have used the lacquer thinner, you need to just wait for the rest of the glue to come off. It should take a couple of days for the natural oils in your skin to get rid of it. Latex-based adhesive – Fortunately, removing latex-based wood glue is slightly easier. All you need is a bottle of acetone or methyl ethyl ketone (MEK). Both of these should be available from your local paint store and will quickly remove the wood glue from your skin. Washing – Once you have removed as much of the wood glue as possible, you need to wash your hand thoroughly with soap and water. Wash up to the elbow, then rinse, and repeat the process. You must make sure that no irritants are left on your skin. If your hands feel dry after the process, you can use a skin moisturizer to bring them back to life. Choose the right glue for your project - There are multiple different types of wood glue available, including PVA glue, epoxy, polyurethane glue, hide glue, and cyanoacrylate glue. All of these glues are strong enough to bond wood together, but they all have different advantages. When you are choosing your glue, you need to decide what you need from it. For example, does it need to be waterproof? How quickly do you want it to set? Is there a gap between the pieces of wood to fill? Make sure the glue is waterproof - For most woodworking projects, it’s best to use a waterproof glue. This isn’t just for outdoor projects, water can get everywhere, and you don’t want it to compromise the strength of your bond. Put masking tape around your joints - Before you start gluing pieces together, you should cover the parts that won’t have glue on them in masking tape. This will prevent excess glue from getting onto these parts and ruining the look of the wood. Apply glue with a flux brush - Flux brushes are perfect for gluing wood because they are precise and aren’t affected by the wood glue itself. Once you have finished spreading the glue, just place it in some water and you can use it again and again. They’re available from most plumbing shops. Don’t use too much glue - The first time you glue wood together you’re probably going to use either too little or too much glue. That’s just part of the learning curve. Ideally, you should have a little bit of excess glue, but not so much that it’s spilling all over your pieces of wood. Prepare your clamps - To properly glue wood together, you will need to use clamps. To keep these clean, you can cover them in wax paper. This will absorb any excess glue and won’t affect your clamps. Rub the joint together - Before you clamp the wood together, rub the pieces together. This will spread the glue evenly and make sure the whole area is covered. Attach one thing at a time - Don’t try and get too clever by clamping multiple things together. Gluing wood takes time, there are no two ways about it. Glue one piece at a time. Be patient and let it dry - Follow the advice on the bottle and then add ten minutes or so. If you want a really solid bond, you are going to have to exercise a little patience. Shave off excess with a chisel - Once the pieces of wood are firmly glued together, you can shave off any excess glue with a sharp chisel. Don’t try and do it with a blunt one because you will get an uneven finish. Scrub with an abrasive pad - Finally, scrub your joint with an abrasive pad. This will take off anything left behind by the chisel and leave you with a smooth and even finish. Q: What is the best glue to use for wood? A: There are multiple different types of glue that are suitable for gluing wood together. These include PVA glue, epoxy, polyurethane glue, hide glue, and cyanoacrylate glue. There isn’t one that is the ‘best’ for gluing wood together, but they will all do the job. Q: Is wood glue the same as PVA glue? A: PVA is just a type of glue, that is perfect for gluing wood together. It is not the only type of wood glue but can certainly be used for this purpose. Q: Is wood glue stronger than wood? A: Yes, the glue used to bond wood together is usually stronger than the wood itself. Of course, this depends on the type of glue and the type of wood in question. But it’s safe to say that modern wood glue is very strong. Q: How long should I clamp glued wood? A: On your bottle of wood glue, it will normally recommend exactly how long to leave the wood clamped together for. If you are in doubt, leave the wood glued together for 24 hours. Q: How do you remove glue marks from wood? A: Wipe with a damp cloth and a small amount of oil. You should only use oil if the wood has been varnished. Keep checking the wood to see if the glue has been removed.